TM allows you to manually build teams, or it can automatically build teams for you. TM provides a wide range of powerful pairing options. For example, you can let TM build simple foursomes requiring an A,B,C,D golfer in each foursome. Or you could set TM to build a complex 2 men 2 women in each foursome, each from a different club (group), pure with respect to walk\ride, considering each golfer's preferred tee-time, trying to balance each foursome A,B,C,D, ... while trying to maintain equal team handicaps.....while making sure that each successive event each golfer does not have the same partners. You know how long that would take to do manually; TM does it in a matter of seconds! To build teams manually simply drag the icon to the left of each player’s name and drop it on whichever team you wish him\her to be on. Or double-click the player to bring up his\her Tournament Info form, type in the correct team number and click OK.
Or press the ENTER key to bring up the player's Tournament Info form, type in the correct team number and press ENTER. 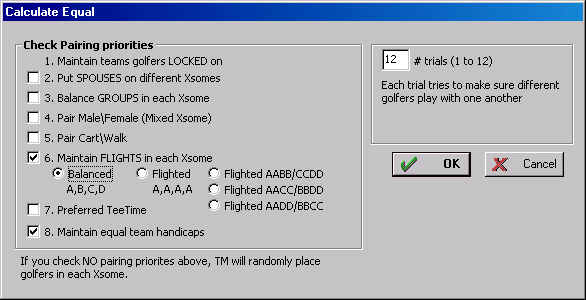 Calculates xsomes with total group handicaps as close as possible for each xsome. Calculates xsomes with a balanced number of flights in each xsome. For example, a balanced foursome would try to produce an A,B,C,D in each foursome while trying to maintain equal team handicaps. Calculates xsomes with the same flight in each xsome. For example, a flighted foursome would try to produce an A,A,A,A in each foursome while trying to maintain equal teams. The next set of foursomes would be B,B,B,B...etc. Other ways to flight include AABB/CCDD, AACC/BBDD, and AADD/BBCC. Calculates xsomes with lowest handicap golfers on team #1 and highest handicap golfers on the last team. Calculates xsomes with highest handicap golfers on team #1 and lowest handicap golfers on the last team. Calculates xsomes, trying to make sure each golfer plays with a different set of golfers for each successive event with as few repeats as possible. Play with all also rotates different tee-times and start holes. You can adjust the number of events (up to 24) you wish to play across. The quick view lets you see the number of times a player will play each other and number of times a tee-time/start-hole will be played. For example, if you had a group of 20 golfers that you wanted to pair into twosomes, TM would calculate 19 events in which every golfer plays with every other golfer one time. If you are viewing round 2, 3, or 4 of a multi-round tournament you have the option to build teams by total gross or total net scores. Click the appropriate option. TM will automatically build teams with highest gross\net golfer to lowest gross\net golfer. After selecting equal, balanced, or flighted, the Calculate form will appear. This form gives you several options to customize team pairings. Select the options you want TM to consider while building teams. TM follows an order of priorities when trying to build the teams you specify. This means TM builds teams, making sure it maintains each priority in the order they are listed. For example, if you mark "Pairing Priorities" 4-Pair Male\Female and 7-Preferred Tee-Time, TM would first try to build mixed Xsomes and then try to give preferred tee-times. TM allows you to lock any number of players on the same team. This allows you to manually build some teams (or parts of teams) and let TM automatically pair the rest. A player is locked on a team if a "Check" appears in the "Lock" column (this is the first column on the view list). Once a player is locked on a team, he\she will remain on that team no matter what (unless you have locked more players on a team than allowed). This is TM's first priority...to maintain locked players. The more players you lock together, the more you restrict TM's pairing choices. If you notice that TM is building "poor" teams, it probably means that you have so many players locked that TM's pairing choices are severely restricted. Example: If you have 3 golfers that must play together, place them on the same team and make sure each is locked on that team. Tip: To lock or unlock all players, pull down the Edit menu and click Select All. All players will be highlighted. Right-click any player and select Edit player’s Tournament Info. Check or uncheck the Lock On Current Team box and click OK. All players are now locked or unlocked. Mark this option if you do NOT want spouses on the same team. TM tries to make sure spouses do NOT appear on the same team. What TM is actually doing is trying to make sure players with the same last name do not appear on the same team. TM tries to spread players (from each different tee group) evenly throughout all xsomes. Example: Assume I'm running a tournament with 100 golfers. 25 are professionals and the other 75 amateurs. I want to calculate 25 equal foursomes with one professional per foursome and the remaining three amateurs. I would place all professionals in tee group 1 and all amateurs in tee group 2. Then when I mark "Balance Groups" and calculate pairings, it will assure that a professional appears in each foursome. Note: Another way to do this would be to lock each professional on a different team, then let TM build the teams. Mark this to produce mixed xsomes. TM will try to place an equal number of male\female in each xsome. Example: If you mark this option and calculate 4somes, TM will place 2 men and 2 women on each team. Mark this and TM will try to keep riders and walkers together. If a player's "Reserve Cart" field (displayed under the 'Cart' column) is marked, he is considered a rider. Tries to place golfers who prefer an early tee-time on the first few teams and golfers who prefer late tee-times on later teams. TM always tries to build equal teams. Maintaining equal team handicaps is TM's last priority, so remember, the more pairing options you select the more you restrict TM's capabilities of building equal teams. TM lets you calculate up to 12 trials. Each successive trial makes sure each golfer plays with a different set of golfers.